Rain, Rain everywhere but not a drop to Drink…. There is a great website for snow. It appears the average Janurary 2017 snowfall is now over 20′. That’s a lot of digging. The Bay Area was not spared any less moisture….we have had our way over normal 20” of rain just since January 1st. 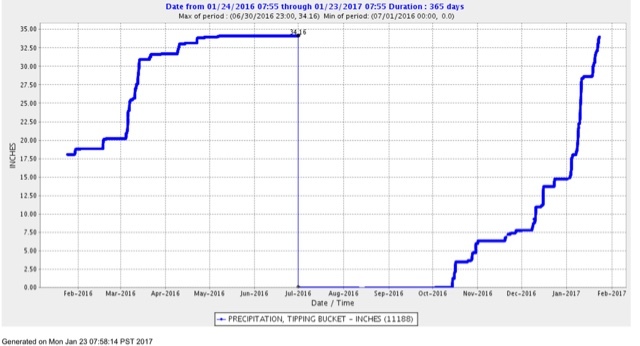 Our local rain stations shows us now at the level of last year’s rain for the season and about 20% overall full year normal. And if you look at the graph on the left, you can see last year’s increase after January 23rd……so if it were to rain like this again this year we could be pushing 50” of rain for the season. Btw…not to get political, but there has been some discussion about Trump and prayers at the inauguration and in the National Cathedral. There is certainly a different spin to these from the years with Obama. We can only pray that the truth be that truely “God Blesses America”. But perhaps we should recall another time and place and purpose of God’s stated blessings. This is an old Bethel Bible training concept. As noted in the video, the rain that fell in Genesis was a judgment on all the people of the earth (except for the 8 faithful in Noah’s family). Also as noted in the video, Jesus said in Matthew 5:45 that rain falls on the just and the unjust. God raises up leaders and He takes them down. (Daniel 2:21, Psalm 75:7). Just because President Trump won the election does not necessarily mean God is blessing him or America. God could be judging America by raising up President Trump. The same could apply to ex-President Obama. We don’t know what was in God’s mind when He raised those men up. We do not know why He allowed President Harrison to lead for only 30 days while He has allowed Queen Elizabeth II to reign for 23,725 days. In order to state that rain is a sign of blessing at any particular moment, one would have to be able to interpret the omen. God used the Prophets of old as a sign to the people. When Moses threw down his staff and it turned into a snake, it was a sign (omen) and Pharaoh understood it as a sign. He did not interpret it correctly, of course, since he had his own wizards standing by who performed the same sign. Pharaoh interpreted that Moses’ God was as not powerful as his false god and that Pharaoh could continue to resist God with no harm, no foul. He was wrong. These portents occurred in the Bible, usually through God’s prophets, when it served God’s purpose. However, the Bible expressly forbids divination of any kind: “Let no one be found among you who . . . interprets omens. . . . Anyone who does these things is detestable to the Lord” (Deuteronomy 18:10–12). We do not live by superstition, and we should not be searching for good or evil omens. Our understanding of the spiritual world does not come through the occult. God has given us the ultimate sign of His goodness, love, and grace in Jesus Christ (1 John 4:9). The Bible is our source for spiritual insight (2 Peter 1:19–21). Previous postGenesis 7:12 And the rain was upon the earth forty days and forty nights. Next postJohn 8 & 9 – The Sin that Remaineth!